A week ago, I had the pleasure of teaching a friend of a friend how to make a few Indian dishes. I was introduced to Kara by Jenn Sutherland of The Whole Kitchen and after months of exchanging tweets and emails, Kara thought we should finally meet IRL and she asked me to plan an individual cooking class for her where she’d learn how to make a few basic Indian dishes. 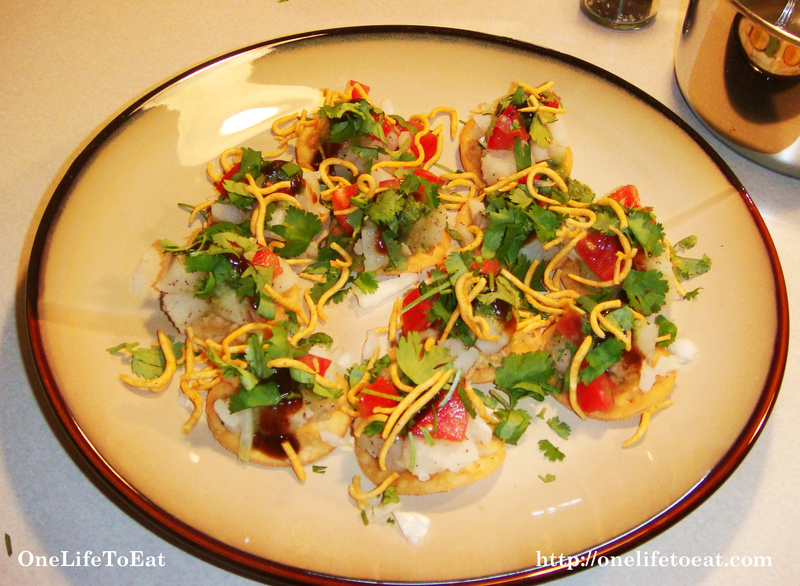 This was the first time I taught a student how to make not one, but two Indian street food dishes – Sev Puri and Samosa Chat. The former, is a wheat cracker (puri), that is topped with assorted vegetables and a variety of tangy, spicy chutneys. The final finish, fine gramflour sev is added on top for a taste-bud popping morsel of deliciousness. You’ll find a Sev Puri vendor on almost every other street corner of Mumbai and every vendor will have his own method of making it. My favorite Sev Puri vendor usually has his little stand right outside a pharmacy in Tardeo, Mumbai. I really hope he’s still around when I visit home next! Samosa Chat is a very popular North Indian street food. Samosas are India’s answer to puff pastries. They are flour triangular pastries stuffed traditionally with spiced potatoes and peas. They can also be stuffed with cooked dry lentils and mince meat to name a few varieties. 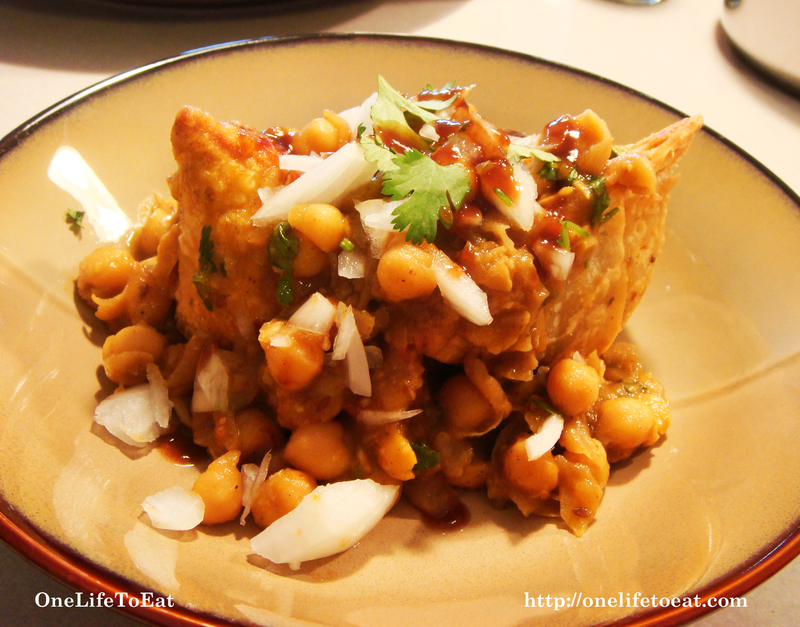 Samosa Chat, comprises of a samosa, topped with a spicy, tangy curry made with chickpeas. Flat wheat puris from the Indian grocery store. If you can’t find these easily, specifically ask the store manager for crispy puris for making sev puri (as a soft version of the puri is also available). Peel and Chop the boiled potatoes and place in a bowl. Season with salt, pepper and juice of ¼ lemon juice. Mix well and keep aside. In a small bowl, place 3-4 spoonfuls of the Tamarind chutney and dilute with about 2-3 tbsp of water till it is thin but not watery. Repeat the same with the Cilantro chutney. End with a squeeze of lemon juice. Serve immediately. This is very important – you MUST pop the whole puri in your mouth in one go. This is the way it has to be eaten. For extra measure, place a plate below your mouth to avoid any spills. You can make this a fusion dish by placing the same toppings in a phyllo dough canapé. This one is really easy to make. Just prepare the chickpea curry beforehand, buy store-bought frozen Indian samosas, and assemble when you’re ready to eat. I have seen Samosa Chat prepared in different ways at different restaurants in North India. Some places also top the samosas and chickpea curry with and sweet/sour tamarind chutney. Some others garnish with chopped green chilies. Thanks for the amazing class Sabera! I made the Palak Paneer again yesterday and it turned out great. The Sev Puri makes a great mid-afternoon snack. Your class really helped me know what to look for and get a handle on how to use the spices. Thanks Kara! And very happy to learn you made Palak Paneer all by yourself 🙂 Isn’t Sev Puri the best? So easy to make and maximum satisfaction for the tummy in a jiffy.